The genealogy radio show will be reviewing the Irish DNA Atlas Project. To participate in this study, please see details below or sign up to our newletter. The Irish DNA Atlas is an ongoing study. If you have ancestry from a specific part of Ireland and you are interested in participating, please contact Séamus O’Reilly from the Genealogical Association of Ireland via irish.dna@familyhistory.ie. 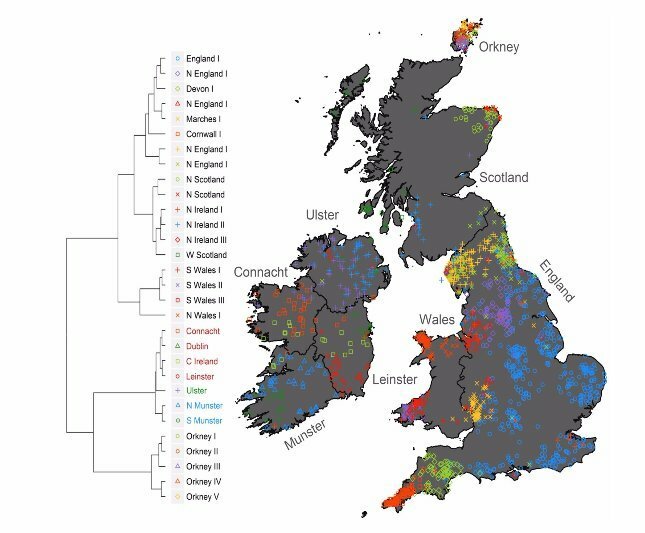 Prior to the mass movement of people in recent decades, there were numerous distinct genetic clusters found in specific regions across Ireland. Two of the ‘Gaelic’ clusters together align with the boundaries of the province of Munster, and individually are associated with the boundaries of the kingdoms of Dál Cais (The Dalcassians were a Gaelic Irish tribe, generally accepted by contemporary scholarship as being a branch of the Déisi Muman, that became a powerful group in Ireland during the 10th century. Their genealogies claimed descent from Cormac Cas, who is said to have lived in the 3rd century AD. )and the Eóganacht. (The Eóganachta or Eoghanachta were an Irish dynasty centred on Cashel which dominated southern Ireland from the 6/7th to the 10th centuries. Later this became the Kingdom of Desmond. By tradition the dynasty was founded by Conall Corc. There are relatively high levels of North-West French-like (probably ‘Celtic’), and evidence of West Norwegian-like (probably Viking) ancestry within Ireland. There is evidence of continual, low level migration between the north of Ireland and the south and west of Scotland. The study is published in the current edition of Scientific Reports http://bit.ly/IrishDNAAtlas We are reviewing this for the Genealogy Radio show.